While I couldn't reach the 600th review last month in time for the seven-year anniversary month of SuperPhillip Central, that allows me to not rush it this month. After this review, there is but one more to the 600th review. However, I'm once again getting ahead of myself. For now, let's take a look at a game that was a SEGA Genesis / Mega Drive classic that received the remake treatment. 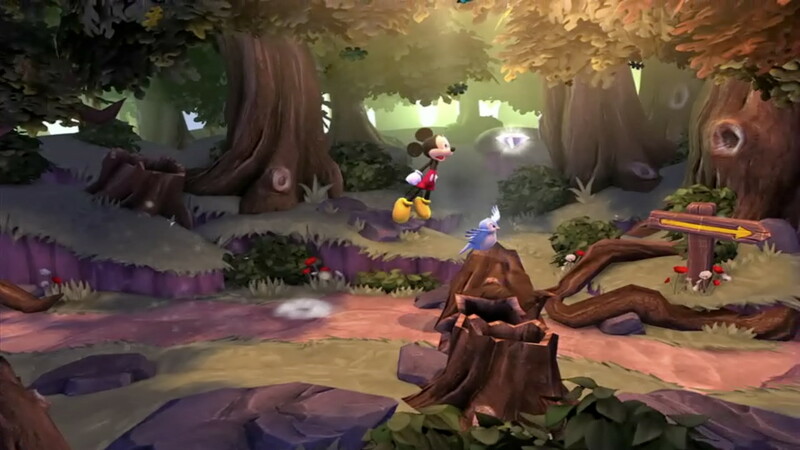 It's Castle of Illusion Starring Mickey Mouse for PSN and XBLA. CAUTION: The quality of this remake is no illusion. Remakes of old games are nothing new to the industry. Whereas Capcom remade DuckTales on the NES, SEGA has taken it upon itself to remake a classic SEGA Genesis / Mega Drive game in Castle of Illusion Starring Mickey Mouse. 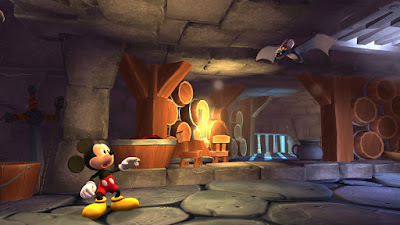 While Capcom's DuckTales Remastered was more of a strict 2D remake, some liberties were taken with Castle of Illusion-- ones that make for a new experience even for those who know the SEGA Genesis / Mega Drive original like the back of their hand. Castle of Illusion plays like an interactive novel with a voice narrating the events of the game during and out of gameplay. Things begin with Mickey and Minnie Mouse having an enjoyable picnic in the forest together. Suddenly, the evil witch Mizrabel (the same evil witch and queen from Snow White, only utilizing an alternate name) drops in and mouse-naps Minnie, intending on using her magic to capture Minnie's beauty. As any hero worth their weight would do, Mickey pursues Mizrabel to the titular Castle of Illusion, cautious but ready to handle the many trials that await inside. to start a platforming adventure, no? The goal of Castle of Illusion is to collect the seven rainbow gems in order to construct a rainbow bridge across the chasm between the castle and Mizrabel's tower. Most of the gems are under the watch of one of five rainbow masters, bosses which require the most of Mickey's cunning to defeat. From bosses like a jack-in-the-box that requires it to knock itself out with its own punching glove to a dragon made out of licorice and parade of Merpeople, a team of aquatic baddies who swim in a pattern that Mickey must avoid. These boss battles aren't too challenging, and they're pretty much the main part of Castle of Illusion that poses a significant difficulty outside of the later platforming levels of the game. This licorice dragon has quite the sweet tooth-- literally! The final boss serves as an interesting battle, but the problem with this is that if you fail it, you have to questionably sit through a thirty second cutscene which starts the encounter each time you lose a life. This is one of the only points in the game where you have to sit through a cutscene, and seeing how the final boss is the most arduous challenge in the game, this can be very frustrating upon repeated fight attempts. As for the platforming levels, Castle of Illusion doesn't strictly adhere to its 2D roots. Many levels feature paths that wrap around other objects in the background, consist of incredible set pieces, and even possess fully 3D elements. 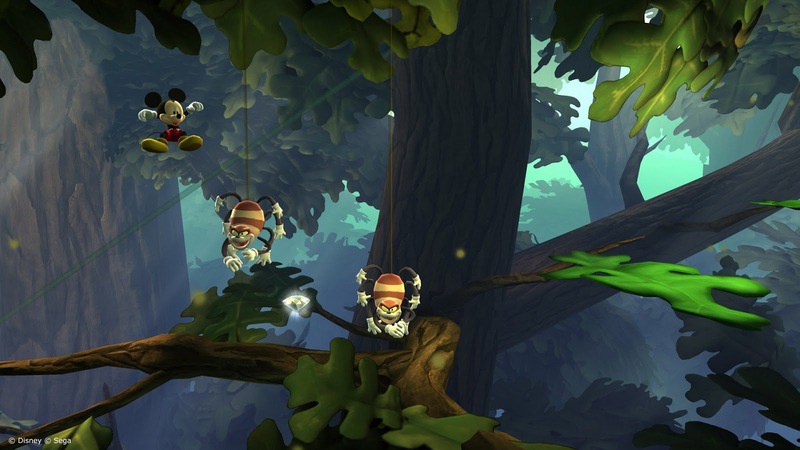 The latter can be a little iffy, especially in more precision-based platforming challenges. 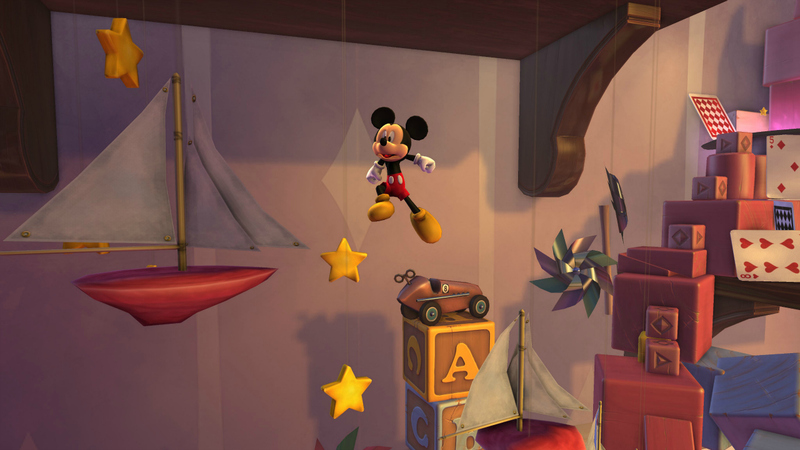 You see, Mickey's jumps are a bit floaty, which can make it hard to gauge jumps in a 3D space. While this didn't cause me many problems, your mileage may vary on this issue. Toyland is a world made up of five-year-old kids' dreams everywhere. Still, falling into a pit or other chasm does not result in a loss of a life. Instead, it just takes off one of Mickey's health, seen as one of five stars. Mickey starts out with three stars to begin with, and he can earn up to two more through collecting them, allowing him and the player more mistakes as levels get more difficult. to get some extra height, great for reaching secret areas. 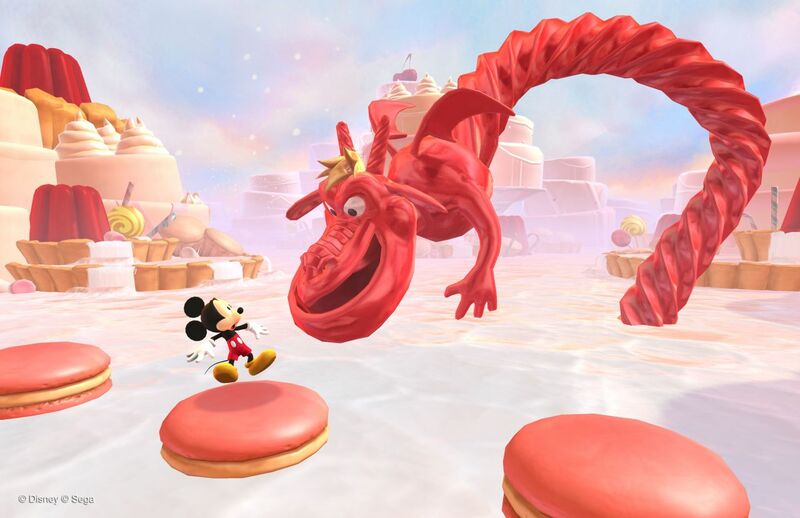 In Mickey's adventure he will navigate a river of milk aboard the tops of sugary cookie platforms, bounce through a land of toys, and maneuver through a clock tower full of rotating and moving parts which can easily ruin the day of an unaware mouse. Castle of Illusion is a relatively short game for the price. You can honestly beat the game in one sitting, but then at the same time you won't have seen and unlocked everything the Illusion has to offer. There are 75 diamonds to collect in each non-boss level, there are statue pieces, playing cards, and chili peppers to nab as well, hidden in some very clever locations. Then there is just the fun of replaying levels in time attack mode. It all adds up to a game that may be over too soon, but one that also contains enough charm and entertainment for repeated play sessions. The visuals of Castle of Illusion look exceptional, offering crisp graphics, colorful worlds, enchanting environments, and well articulated and animated characters. There are a few moments of slowdown here and there, but for the most part, it won't cause that many hits or deaths to Mickey. The music delivers a mysterious and magical feel to the game, also allowing the classic soundtrack to be heard if deemed preferable by the player. Don't let this castle drive you batty, Mickey. Castle of Illusion is a short ride, but it's one that was mighty enjoyable to me. Even after Mizrabel was thwarted, I still had diamonds to return to levels for and the desire to play through the game again. The jumping may be a bit floaty, particularly noticeable in 3D parts of levels, but overall, Castle of Illusion is a spirited take on an old Genesis and Mega Drive classic.